Go on the adventure of a lifetime and take a guided ice walk on Athabasca Glacier. The guided interpretive hikes will take you into the world of glacier ice - reminiscent of the last ice age. The trained glacier guides will ensure that you are capable, properly outfitted and led safely across the glacier. Guided hikes are offered daily from June 1 to September 30. 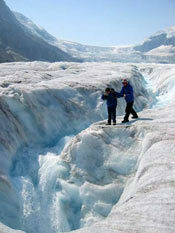 For more information and on hikes on the glacier visit Athabasca Glacier Icewalks click here. Visit the interpretive centre on the lower level of the Icefield Centre.Go souvenir and postcard shopping at the gift shop located on the main level.Have a meal on the second floor at the Icefield Centre.Get more info from Parks Canada information desk on the main level.Check in at the main level for the Icefield Centre hotel! Located on the top floor of the Icefield Centre, this hotel has modest but comfortable rooms with amazing view of the Athabasca Glacier and surrounding mountains.